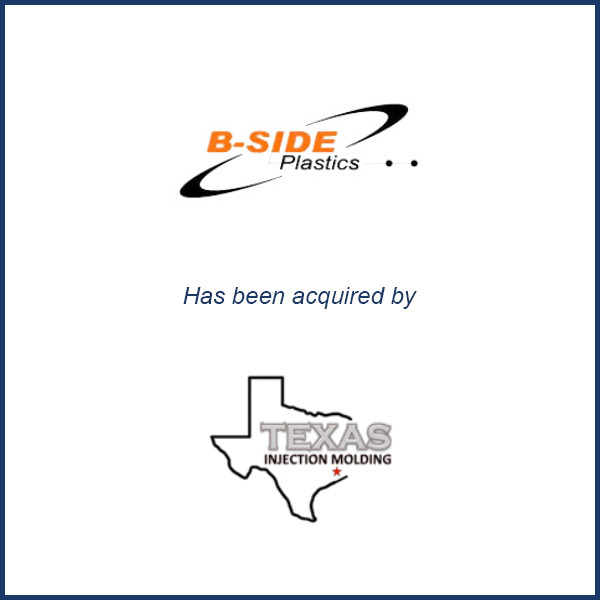 20Houston, TX – December 2013 – A newly formed entity called Texas Injection Molding LLC of Houston, Texas has acquired B-Side Plastics, also of Houston. Texas Injection Molding is owned by industry veteran, Jeff Applegate. B-Side was formed in 2000 by Barry Stiles. B-Side serves customers in the consumer, oil/gas, retail display and agricultural industries. It owns and operates 10 molding machines up to 650 tons and employs 22 full-time employees. June, 2014 – Since the acquisition of B-Side, Texas Injection Molding has purchased five new injection molding machines and several pieces of auxiliary equipment. The machines range from 30-750 tons of clamping force and include two new Milacron MT servo hydraulic toggle machines. The company has also tripled the size of its workforce since the 2013 acquisition. Molding Business Services served as the financial advisor to B-Side Plastics in connection with its December 2013 sale to Texas Injection Molding.